New York, NY – June 18, 2014 -- Credly, the leader in recognizing achievement with digital badges and credentials, today announced a partnership with Eventbrite, the largest marketplace for live experiences. Through the new Credly and Eventbrite integration, organizers certify and reward participation in events with official digital badges. Attendees showcase this official record of their involvement by sharing their digital badges on social and professional networks including LinkedIn, Facebook, and Twitter. 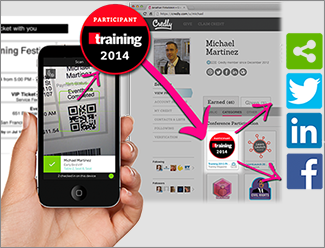 Credly allows event organizers using Eventbrite to issue digital badges at different stages of an event’s lifecycle. If increasing event registration is the key objective, organizers can choose to automatically issue badges as people register. When verifying attendance is critical, they can set badges to be issued as attendees check in or at the conclusion of the event. In addition, Eventbrite registration lists may be synced with Credly contact lists, allowing organizers to issue additional badges before, during or after an event. By participating in conferences, conventions, classes, festivals, fundraisers, endurance and other events, attendees show their contributions and commitment to the causes, communities and trades they care about, as well as to their own professional learning and personal growth. Digital badges meet the need of acknowledging this involvement in a personalized and public way, without the cost, time and resources needed to generate paper certificates. 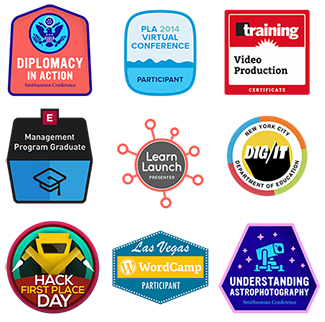 “Digital badges memorialize commitment, contributions and relationships -- which are on display at the best events,” added Finkelstein, who previously founded LearningTimes, a leading producer of online events, outreach and learning programs for groups like the Smithsonian, American Library Association, John Hopkins University, YMCA, and the New York City Department of Education. Credly helps the world recognize lifelong achievement by offering the leading platforms for verifying, sharing and managing digital badges and credentials. Groups like the New York City Department of Education, Adobe, SUNY, Event Leadership Institute, University of Central Florida, Dallas Museum of Art, EDUCAUSE, Instructure, Training Magazine, Yale University, the YMCA of Greater New York, Smithsonian, NMC and the American Alliance of Museums all use Credly to make achievements visible. Visit Credly.com.